The RRCA High School Speech and Debate Team was formed in 2008-2009 to provide a venue for students to compete in forensics competitions. The speech and debate tournament events that students compete in include speaking, reading, acting, and debate. RRCA competes in public and private school invitational tournaments from September onward in preparation for district and state competition for TAPPS and the NFL. RRCA has active membership in the National Forensic League, the speech and debate honor society for public and private schools. In the fall of 2010, our school was designated with Chapter status by the organization, the highest of four rankings a school can obtain. The Speech and Debate Team is coached by Cathleen Ferose. Congratulations to the Crusader Speech & Debate team for placing 1st at the Shamrock Invitational TAPPS prep tournament over the weekend, hosted by Holy Trinity Catholic High School in Temple. A total of 19 private schools from around the state competed in 7 events in preparation for upcoming state competition in Waco on April 1st-3rd. Crusaders took 2nd place overall in team sweepstakes at the 15th annual Celtic Invitational, a 4th-9th grade competition. Crusaders competed against 8 other schools in 13 categories. The Crusader Speech and Debate team won Sweepstakes at the El Campo Tournament, competing against 20 schools in 27 categories. RRCA competed in a great two days of competition with 40 schools competing. Matthew Tweden and Christian Gonzales competed on November 29. Thirty four schools and 168 competitors competed in 3 divisions. Round Rock Christian Academy was one of three private schools represented at the event. Matthew Tweden was a Senate Finalist! 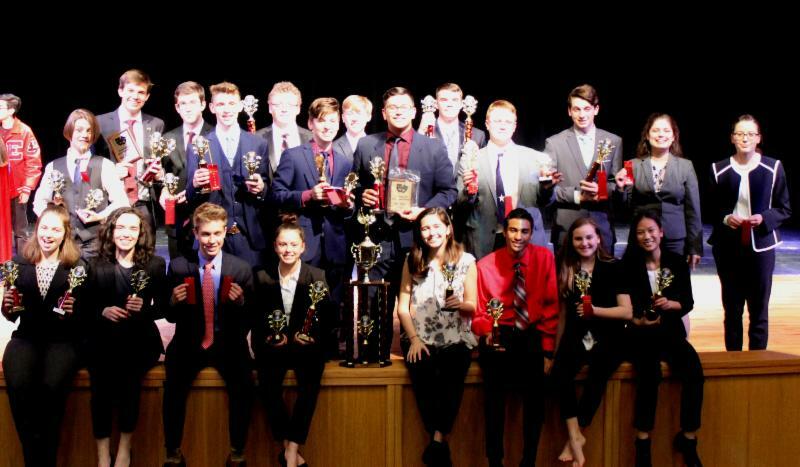 Congratulations to Crusader Speech & Debate for winning team sweepstakes in a close race for top honors at the 14th Annual Trinity Classic Speech and Debate Tournament at Holy Trinity Catholic High School in Temple over the weekend. Crusaders competed against 11 other schools, both public and private, in 13 different debate, speaking, and acting events. Congratulations goes to junior Christian Gonzales who was named Best Actor. Best All Around competitor went to sophomore Matthew Tweden, who wrapped up the day's competition with a decisive 3-0 decision in his 6th and final round of Lincoln Douglas debate, after placing in several other events. Crusaders finished the day with 250 points against NSDA district rival THEO with 239. Coach Cathleen Ferose noted that they were at a disadvantage going into the tournament, with 20 fewer entries. "It was a battle through every event to the final round. Not only is THEO strong, but schools like Concordia, Savio, and CTCS are getting more competitive. We can't take anything for granted." Congratulations to the TAPPS Speech Team for being named State Champions! Congratulations to the RRCA speech and debate competitors for 1st place Team Sweepstakes at the 14th Annual Celtic Invitational at Holy Trinity Catholic High School in Temple. Ten schools competed in 13 speaking, debating, and acting events for grades 4th-9th. Lincoln Douglas Debate: 4th place - Max Chhabra, 3rd place - Kiera Dixon, 2nd place - Grant Brown, and 1st place - Matthew Tweden. RRCA won Grand Sweepstakes at the El Campo High School Speech & Debate Tournament. Congratulations to the Speech and Debate team for placing 2nd overall at the Bay City tournament. Congratulations to the Crusader Speech and Debate team on their Sweepstakes win.